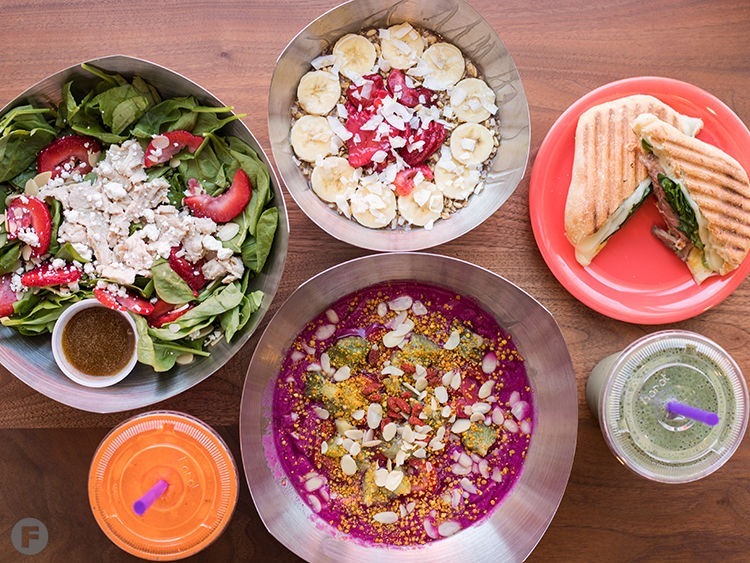 BY FEAST MAGAZINE – A superfood café brand recently debuted its first Missouri location in Richmond Heights. Vitality Bowls opened on July 12, serving açaí bowls, smoothies, fresh juice, paninis and salads. The menu features a wide variety of superfoods including graviola, acerola, mangosteen, camu camu, maca, bee pollen and more. Vitality Bowls originated in San Ramon, California, in 2011 and began franchising in 2014. More than 50 stores are currently open nationwide. The Richmond Heights franchise is independently owned and operated by Sally and Mark Matiszik. The Matisziks’ storefront fills a 1,400-square-foot space in a new development with 32 seats inside and another 14 on an outdoor patio. The dining area features custom handcrafted tables from David Stein Woodworking based out of Dow, Illinois. Framed photos and infographics on the walls outline the key ingredients that go into the menu’s antioxidant-rich core items. Choose from highlights such as Sally’s personal favorite: the Superfood Bowl with a base blend of organic açaí, a Vitality Bowls blend, almond milk, graviola, acerola, kale, bananas and strawberries, topped with organic granola, bananas, blueberries, goji berries, cacao nibs and honey. According to Sally, Vitality Bowls’ next most popular items are its smoothies, which also aim to contain pure nutrition with no fillers such as ice, frozen yogurt, syrups or added sugars. Popular picks include The Hulk with organic açaí, guarana, almond milk, spirulina, kale, broccoli, whey protein, strawberries and bananas. Raw pressed juices are also available such as The Rejuvenator with carrot, apple, cucumber and beet. To round out the menu, choose from paninis such as The Sirloin with grass-fed, seasoned and seared sirloin with mozzarella, spinach and dijon. A discounted panini combo special is available when you add a panini to any menu item. Salads include a spinach salad with spinach, goat cheese, quinoa, strawberries, almonds and housemade balsamic vinaigrette. Vitality Bowls also offers local brands such as Park Avenue Coffee and KomBlu Kombucha for additional beverage options. Going forward, the Matisziks hope to open additional locations in the St. Louis area, including West County. Vitality Bowls is open Monday through Saturday from 8am to 8pm and Sunday from 9am to 8pm.